Marvel is well-known for its synergy and connections in the Marvel Cinematic Universe, and Netflix’s Daredevil won’t be the exception. Although we shouldn’t expect appearances from his fellow Netflix heroes, Daredevil will include Easter Eggs and other teases to both the movies and the other upcoming TV shows. Now it’s been revealed that the series will also share a character with Marvel’s network TV program Agents of S.H.I.E.L.D. 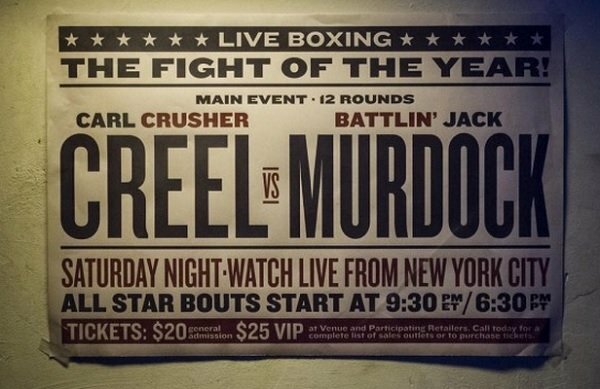 Back in February, the official Daredevil Twitter account posted an image of a banner advertising a boxing match between Matt Murdock’s father Battlin’ Jack Murdock and Crusher Creel, suggesting that the Agents of S.H.I.E.L.D villain, better known as Absorbing Man, would appear during a flashback. Marvel’s Head of Television Jeph Loeb, who is an executive producer on both series, has now confirmed to IGN that Daredevil’s Creel is the same one who appeared on Agents of S.H.I.E.L.D last year, rather than some kind of relative. Loeb included Crusher in his 2001 graphic novel Daredevil: Yellow as one of Jack’s many boxing opponents. While Wade is extremely fit, he can’t pull off looking eighteen or anything around that age, so if Crusher does appear in Daredevil, it’s almost certain a younger actor will play him in the ring. Crusher appeared in the first two episodes of Agents of S.H.I.E.L.D Season 2 as a criminal who could turn his body into any substance that he touched. He was recruited by Season 1 antagonist John Garrett to be an assassin for HYDRA, and in the Season 2 premiere he was sent to steal the Obelisk, an 0-8-4 (object of unknown origin) that petrified nearly every person that touched it, making Creel’s powers useful for handling the artifact since he could cover his skin with something else. Unfortunately for him, Phil Coulson used a device to negate his ability, and since Crusher was holding the Obelisk when it happened, he was soon petrified and is now in the custody of the U.S. government. All 13 episodes of Daredevil will be available on Netflix at 12:01 a.m. this Friday, and you can catch Agents of S.H.I.E.L.D Tuesdays at 9/8c on ABC.